Persistent gastroesophageal reflux (GER) disease (GERD) is one of the most frequent disorders for which infants and children undergo abdominal surgery. [1, 2] However, most children with GERD may be treated nonsurgically. Appropriate therapy for GERD is based on the underlying pathophysiology, the clinical presentation, and accurately interpreted diagnostic test results. For patient education resources, see the Children's Health Center, as well as Spitting Up in Infants. The anatomy of the esophagus, stomach, and EGJ is critical in the understanding of the pathogenesis of reflux. The proximal esophagus contains the upper esophageal sphincter (UES), which comprises the cricopharyngeus and thyropharyngeus muscles. The body of the esophagus is made up of inner circular and outer longitudinal muscular layers. The proximal third of the esophagus is smooth muscle, which transitions to striated muscle in the distal two thirds. The lower esophageal sphincter (LES) is the distalmost segment of the esophagus (3-5 cm in adults), and its ability to prevent reflux depends on a number of anatomic factors. 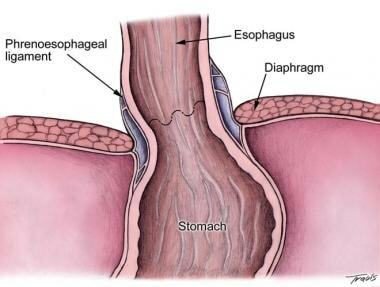 As the esophagus passes through the diaphragmatic hiatus, it becomes the abdominal esophagus. The right crus of the diaphragm forms a sling around the esophagus so that the esophagus narrows when the diaphragm contracts. [15, 16, 17] At this level, the phrenoesophageal ligament, which is the reflection of the subdiaphragmatic fascia onto the transversalis fascia of the anterior abdominal wall, also encircles the esophagus (see the image below). The EGJ is in the abdomen and forms the angle of His. The acute angle and the length of abdominal esophagus both contribute to the normal closure of the esophagus when intragastric and intra-abdominal pressures are high. Relationship of the phrenoesophageal ligament to the diaphragm and esophagus. The blood supply of the esophagus is segmental (see the image below). The inferior thyroid artery supplies the cervical esophagus. Branches of the bronchial arteries and branches directly off of the aorta supply the proximal and distal thoracic esophagus, respectively. Finally, branches of the left gastric and inferior phrenic artery supply the abdominal esophagus. A relatively constant branch connects the left gastric and inferior phrenic arteries (the Belsey artery). 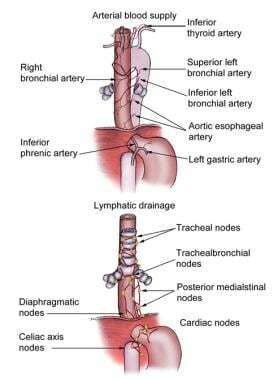 Arterial blood supply and lymphatic drainage of the esophagus. The blood supply of the stomach is rich, with overlap among the vessels. The lesser curvature is supplied by the left and right gastric arteries, which are branches of the celiac trunk and the proper hepatic artery, respectively. The greater curvature is supplied by the right gastroepiploic artery arising from the gastroduodenal artery and the left gastroepiploic artery and the short gastric arteries originating from the splenic artery. This excellent collateral blood supply of the stomach allows the surgeon to ligate much of the arterial supply (ie, the short gastric arteries during fundoplication) without risk of ischemia. Nearly all infants have some degree of GER, but it is usually transient and does not cause any morbidity. However, in some children, the reflux is pathologic and persistent, causing feeding difficulties, failure to thrive, aspiration or respiratory complications, esophagitis, and esophageal stricture. GERD occurs on a continuum that ranges from mild physiologic reflux to a severe debilitating problem. In healthy term and preterm infants, the mechanism of GER is primarily frequent transient relaxation of the LES and otherwise normal esophageal motor function. Transient LES relaxation occurs normally and is a mechanism to vent air from the distended stomach. However, in some children, LES relaxation is frequent and prolonged, leading to pathologic reflux. Unlike physiologic LES relaxation, GER is primarily observed during episodes of sphincter relaxation unassociated with swallowing. Some children, such as those with neurologic disorders, may be predisposed to frequent LES relaxation, which leads to irritation of the esophageal mucosa by hydrochloric acid. Esophagitis causes further dysfunction of the LES, creating a cycle of continuing injury. In addition to LES relaxation, esophageal dysmotility may also play a role in pediatric GER. In a study of 25 pediatric patients with GERD, esophageal manometry and 24-hour pH probes were used to correlate esophageal contractions with acid-reflux episodes  ; patients with GERD had significantly fewer and less sustained esophageal contractions than those without reflux. This difference may be important, in that the presence of esophageal dysmotility in a subset of pediatric GERD patients could be a relative contraindication for operative management. The passage of food from the esophagus to the stomach is facilitated by a transient relaxation of the distal esophagus, which is initiated by swallowing-induced peristaltic waves. The resting tone of the distal esophagus is important in preventing reflux of gastric contents into the thoracic portion of the esophagus. The anatomic area integral to the prevention of reflux is the abdominal esophagus, where the high-pressure zone (HPZ) is located. Other factors implicated in the genesis of GER include abnormal or altered anatomy, such as hiatal hernia, short esophagus, and gastrostomy. Medications that decrease LES pressure, such as methylxanthines and calcium-channel blockers, may also exacerbate GER. Long-term data in children are sparse; however, the success rate of antireflux surgery is generally thought to be good. A series of more than 1000 laparoscopic Nissen fundoplications over 10 years in infants and children revealed good outcomes, with a 4% wrap-failure rate. A second report of studies of 1280 children concluded that the median success rate was 86%. The 24-hour pH study has been used to objectively evaluate outcomes following antireflux surgery. A prospective review of 53 pediatric patients treated with the laparoscopic Thal fundoplication found that 25% had pathologic reflux at follow-up, though 90% of patients reported that they were symptom-free. This underscores the need for additional objective outcome studies. Both surgical and medical management tend to have a high failure rate in children with neurologic impairment. Many of these children have serious coexisting morbidity and relatively short life expectancy. In a study of 300 fundoplications (277 primary, 23 redo) in 279 pediatric GERD patients, Koivusalo et al found that primary fundoplication led to control of symptoms in nearly 90% of patients and reduced the rate of esophagitis as well. Primary fundoplication failed in 15% of patients; factors increasing the risk of failure included an underlying disorder, esophageal atresia, and hiatoplasty. Of the 23 redo procedures, 32% failed. Fonkalsrud EW, Ashcraft KW, Coran AG, et al. Surgical treatment of gastroesophageal reflux in children: a combined hospital study of 7467 patients. Pediatrics. 1998 Mar. 101(3 Pt 1):419-22. [Medline]. [Full Text]. Blanco FC, Davenport KP, Kane TD. Pediatric gastroesophageal reflux disease. Surg Clin North Am. 2012 Jun. 92(3):541-58, viii. [Medline]. Boerema I. Hiatus hernia: repair by right-sided, subhepatic, anterior gastropexy. Surgery. 1969 Jun. 65(6):884-93. [Medline]. Allison PR. Hiatus hernia: (a 20-year retrospective survey). Ann Surg. 1973 Sep. 178(3):273-6. [Medline]. Varshney S, Kelly JJ, Branagan G, et al. Angelchik prosthesis revisited. World J Surg. 2002 Jan. 26(1):129-33. [Medline]. Nissen R, Rossetti M, Siewert R. 20 years in the management of reflux disease using fundoplication [in German]. Chirurg. 1977 Oct. 48(10):634-9. [Medline]. Kazerooni NL, VanCamp J, Hirschl RB, et al. Fundoplication in 160 children under 2 years of age. J Pediatr Surg. 1994 May. 29(5):677-81. [Medline]. Dallemagne B, Weerts JM, Jehaes C, et al. Laparoscopic Nissen fundoplication: preliminary report. Surg Laparosc Endosc. 1991 Sep. 1(3):138-43. [Medline]. Nilsson G, Larsson S, Johnsson F. Randomized clinical trial of laparoscopic versus open fundoplication: blind evaluation of recovery and discharge period. Br J Surg. 2000 Jul. 87(7):873-8. [Medline]. Wenner J, Nilsson G, Oberg S, et al. Short-term outcome after laparoscopic and open 360 degrees fundoplication. A prospective randomized trial. Surg Endosc. 2001 Oct. 15(10):1124-8. [Medline]. Somme S, Rodriguez JA, Kirsch DG, Liu DC. Laparoscopic versus open fundoplication in infants. Surg Endosc. 2002 Jan. 16(1):54-6. [Medline]. Rangel SJ, Henry MC, Brindle M, Moss RL. Small evidence for small incisions: pediatric laparoscopy and the need for more rigorous evaluation of novel surgical therapies. J Pediatr Surg. 2003 Oct. 38(10):1429-33. [Medline]. Rothenberg SS. The first decade's experience with laparoscopic Nissen fundoplication in infants and children. J Pediatr Surg. 2005 Jan. 40(1):142-6; discussion 147. [Medline]. Rosales A, Whitehouse J, Laituri C, Herbello G, Long J. Outcomes of laparoscopic nissen fundoplications in children younger than 2-years: single institution experience. Pediatr Surg Int. 2018 May 28. [Medline]. Mittal RK, Rochester DF, McCallum RW. Sphincteric action of the diaphragm during a relaxed lower esophageal sphincter in humans. Am J Physiol. 1989 Jan. 256(1 Pt 1):G139-44. [Medline]. Mittal RK, McCallum RW. Characteristics of transient lower esophageal sphincter relaxation in humans. Am J Physiol. 1987 May. 252(5 Pt 1):G636-41. [Medline]. Mittal RK, Rochester DF, McCallum RW. Effect of the diaphragmatic contraction on lower oesophageal sphincter pressure in man. Gut. 1987 Dec. 28(12):1564-8. [Medline]. Omari TI, Barnett C, Snel A, et al. Mechanisms of gastroesophageal reflux in healthy premature infants. J Pediatr. 1998 Nov. 133(5):650-4. [Medline]. Kawahara H, Dent J, Davidson G. Mechanisms responsible for gastroesophageal reflux in children. Gastroenterology. 1997 Aug. 113(2):399-408. [Medline]. Chitkara DK, Fortunato C, Nurko S. Esophageal motor activity in children with gastro-esophageal reflux disease and esophagitis. J Pediatr Gastroenterol Nutr. 2005 Jan. 40(1):70-5. [Medline]. O'Sullivan GC, DeMeester TR, Joelsson BE, et al. Interaction of lower esophageal sphincter pressure and length of sphincter in the abdomen as determinants of gastroesophageal competence. Am J Surg. 1982 Jan. 143(1):40-7. [Medline]. Winans CS, Harris LD. Quantitation of lower esophageal sphincter competence. Gastroenterology. 1967 May. 52(5):773-8. [Medline]. Halpern LM, Jolley SG, Johnson DG. Gastroesophageal reflux: a significant association with central nervous system disease in children. J Pediatr Surg. 1991 Feb. 26(2):171-3. [Medline]. Little DC, Rescorla FJ, Grosfeld JL, et al. Long-term analysis of children with esophageal atresia and tracheoesophageal fistula. J Pediatr Surg. 2003 Jun. 38(6):852-6. [Medline]. Banjar HH, Al-Nassar SI. Gastroesophageal reflux following repair of esophageal atresia and tracheoesophageal fistula. Saudi Med J. 2005 May. 26(5):781-5. [Medline]. Koch A, Rohr S, Plaschkes J, Bettex M. Incidence of gastroesophageal reflux following repair of esophageal atresia. Prog Pediatr Surg. 1986. 19:103-13. [Medline]. Gold BD. Outcomes of pediatric gastroesophageal reflux disease: in the first year of life, in childhood, and in adults...oh, and should we really leave Helicobacter pylori alone?. J Pediatr Gastroenterol Nutr. 2003 Nov-Dec. 37 Suppl 1:S33-9. [Medline]. Pearl RH, Robie DK, Ein SH, et al. Complications of gastroesophageal antireflux surgery in neurologically impaired versus neurologically normal children. J Pediatr Surg. 1990 Nov. 25(11):1169-73. [Medline]. Celik A, Loux TJ, Harmon CM, Saito JM, Georgeson KE, Barnhart DC. Revision Nissen fundoplication can be completed laparoscopically with a low rate of complications: a single-institution experience with 72 children. J Pediatr Surg. 2006 Dec. 41(12):2081-5. [Medline]. Danielson PD, Emmens RW. Esophagogastric disconnection for gastroesophageal reflux in children with severe neurological impairment. J Pediatr Surg. 1999 Jan. 34(1):84-6; discussion 87. [Medline]. Goyal A, Khalil B, Choo K, et al. Esophagogastric dissociation in the neurologically impaired: an alternative to fundoplication?. J Pediatr Surg. 2005 Jun. 40(6):915-8; discussion 918-9. [Medline]. Buratti S, Kamenwa R, Dohil R, et al. Esophagogastric disconnection following failed fundoplication for the treatment of gastroesophageal reflux disease (GERD) in children with severe neurological impairment. Pediatr Surg Int. 2004 Oct. 20(10):786-90. [Medline]. Koivusalo AI, Pakarinen MP. Outcome of Surgery for Pediatric Gastroesophageal Reflux: Clinical and Endoscopic Follow-up after 300 Fundoplications in 279 Consecutive Patients. Scand J Surg. 2018 Mar. 107 (1):68-75. [Medline]. Orenstein SR. Esophageal disorders in infants and children. Curr Opin Pediatr. 1993 Oct. 5(5):580-9. [Medline]. Orenstein SR, Shalaby TM, Cohn JF. Reflux symptoms in 100 normal infants: diagnostic validity of the infant gastroesophageal reflux questionnaire. Clin Pediatr (Phila). 1996 Dec. 35(12):607-14. [Medline]. Gupta SK, Hassall E, Chiu YL, Amer F, Heyman MB. Presenting symptoms of nonerosive and erosive esophagitis in pediatric patients. Dig Dis Sci. 2006 May. 51(5):858-63. [Medline]. Heine RG, Jordan B, Lubitz L, Meehan M, Catto-Smith AG. Clinical predictors of pathological gastro-oesophageal reflux in infants with persistent distress. J Paediatr Child Health. 2006 Mar. 42(3):134-9. [Medline]. Suskind DL, Thompson DM, Gulati M, et al. Improved infant swallowing after gastroesophageal reflux disease treatment: a function of improved laryngeal sensation?. Laryngoscope. 2006 Aug. 116(8):1397-403. [Medline]. Euler AR, Byrne WJ, Ament ME, et al. Recurrent pulmonary disease in children: a complication of gastroesophageal reflux. Pediatrics. 1979 Jan. 63(1):47-51. [Medline]. Tieder JS, Cowan CA, Garrison MM, Christakis DA. Variation in inpatient resource utilization and management of apparent life-threatening events. J Pediatr. 2008 May. 152(5):629-35, 635.e1-2. [Medline]. Amin RS. Gastroesophageal reflux and infant apnea. J Pediatr. 2000 Sep. 137(3):298-300. [Medline]. Alex N, Thompson JM, Becroft DM, Mitchell EA. Pulmonary aspiration of gastric contents and the sudden infant death syndrome. J Paediatr Child Health. 2005 Aug. 41(8):428-31. [Medline]. Faubion WA Jr, Zein NN. Gastroesophageal reflux in infants and children. Mayo Clin Proc. 1998 Feb. 73(2):166-73. [Medline]. Yüksel H, Yilmaz O, Kirmaz C, Aydogdu S, Kasirga E. Frequency of gastroesophageal reflux disease in nonatopic children with asthma-like airway disease. Respir Med. 2006 Mar. 100(3):393-8. [Medline]. Khoshoo V, Le T, Haydel RM Jr, Landry L, Nelson C. Role of gastroesophageal reflux in older children with persistent asthma. Chest. 2003 Apr. 123(4):1008-13. [Medline]. Weinberger M. Gastroesophageal reflux disease is not a significant cause of lung disease in children. Pediatr Pulmonol Suppl. 2004. 26:197-200. [Medline]. Rosen R, Nurko S. The importance of multichannel intraluminal impedance in the evaluation of children with persistent respiratory symptoms. Am J Gastroenterol. 2004 Dec. 99(12):2452-8. [Medline]. Condino AA, Sondheimer J, Pan Z, Gralla J, Perry D, O’Conner JA. Evaluation of gastroesophageal reflux in pediatric patients with asthma using impedence-pH monitoring. J Pediatrics. 2006. 149:216-219. [Medline]. Hassall E. Barrett's esophagus: congenital or acquired?. Am J Gastroenterol. 1993 Jun. 88(6):819-24. [Medline]. Al-Khawari HA, Sinan TS, Seymour H. Diagnosis of gastro-oesophageal reflux in children. Comparison between oesophageal pH and barium examinations. Pediatr Radiol. 2002 Nov. 32(11):765-70. [Medline]. Lombardi G, de' Angelis G, Rutigliano V, Guariso G, Romano C, Falchetti D, et al. Reflux oesophagitis in children; the role of endoscopy. A multicentric Italian survey. Dig Liver Dis. 2007 Sep. 39(9):864-71. [Medline]. Chang EY, Minjarez RC, Kim CY, Seltman AK, Gopal DV, Diggs B, et al. Endoscopic ultrasound for the evaluation of Nissen fundoplication integrity: a blinded comparison with conventional testing. Surg Endosc. 2007 Oct. 21(10):1719-25. [Medline]. Chen S, Jarboe MD, Teitelbaum DH. Effectiveness of a transluminal endoscopic fundoplication for the treatment of pediatric gastroesophageal reflux disease. Pediatr Surg Int. 2012 Mar. 28(3):229-34. [Medline]. Okada T, Honda S, Miyagi H, Minato M. Nissen fundoplication for gastroesophageal reflux: No deterioration of gastric emptying measured by C-acetate breath test. J Indian Assoc Pediatr Surg. 2011 Oct. 16(4):137-41. [Medline]. [Full Text]. Boix-Ochoa J, Lafuenta JM, Gil-Vernet JM. Twenty-four hour esophageal pH monitoring in gastroesophageal reflux. J Pediatr Surg. 1980 Feb. 15(1):74-8. [Medline]. Sondheimer JM. Continuous monitoring of distal esophageal pH: a diagnostic test for gastroesophageal reflux in infants. J Pediatr. 1980 May. 96(5):804-7. [Medline]. Semeniuk J, Kaczmarski M. 24-hour esophageal pH-monitoring in children suspected of gastroesophageal reflux disease: analysis of intraesophageal pH monitoring values recorded in distal and proximal channel at diagnosis. World J Gastroenterol. 2007 Oct 14. 13(38):5108-15. [Medline]. Vandenplas Y, Salvatore S, Vieira MC, Hauser B. Will esophageal impedance replace pH monitoring?. Pediatrics. 2007 Jan. 119(1):118-22. [Medline]. Mattioli G, Pini-Prato A, Gentilino V, Caponcelli E, Avanzini S, Parodi S. Esophageal impedance/pH monitoring in pediatric patients: preliminary experience with 50 cases. Dig Dis Sci. 2006 Dec. 51(12):2341-7. [Medline]. Mattioli G, Gentilino V, Caponcelli E, et al. Effectiveness of esophageal manometry in predicting the outcome of children with primary GER after floppy Nissen-Rossetti wrap. Surg Endosc. 2004 Oct. 18(10):1504-8. [Medline]. Winter HS, Madara JL, Stafford RJ, et al. Intraepithelial eosinophils: a new diagnostic criterion for reflux esophagitis. Gastroenterology. 1982 Oct. 83(4):818-23. [Medline]. Mattioli G, Bax K, Becmeur F, Esposito C, Heloury Y, Podevin G, et al. European multicenter survey on the laparoscopic treatment of gastroesophageal reflux in patients aged less than 12 months with supraesophageal symptoms. Surg Endosc. 2005 Oct. 19(10):1309-14. [Medline]. [Guideline] Vandenplas Y, Rudolph CD, Di Lorenzo C, Hassall E, Liptak G, Mazur L, et al. Pediatric gastroesophageal reflux clinical practice guidelines: joint recommendations of the North American Society for Pediatric Gastroenterology, Hepatology, and Nutrition (NASPGHAN) and the European Society for Pediatric Gastroenterology, Hepatology, and Nutrition (ESPGHAN). J Pediatr Gastroenterol Nutr. 2009 Oct. 49(4):498-547. [Medline]. [Guideline] Rosen R, Vandenplas Y, Singendonk M, Cabana M, DiLorenzo C, Gottrand F, et al. Pediatric Gastroesophageal Reflux Clinical Practice Guidelines: Joint Recommendations of the North American Society for Pediatric Gastroenterology, Hepatology, and Nutrition and the European Society for Pediatric Gastroenterology, Hepatology, and Nutrition. J Pediatr Gastroenterol Nutr. 2018 Mar. 66 (3):516-554. [Medline]. [Full Text]. Corvaglia L, Rotatori R, Ferlini M, Aceti A, Ancora G, Faldella G. The effect of body positioning on gastroesophageal reflux in premature infants: evaluation by combined impedance and pH monitoring. J Pediatr. 2007 Dec. 151(6):591-6, 596.e1. [Medline]. van Wijk MP, Benninga MA, Dent J, Lontis R, Goodchild L, McCall LM. Effect of body position changes on postprandial gastroesophageal reflux and gastric emptying in the healthy premature neonate. J Pediatr. 2007 Dec. 151(6):585-90, 590.e1-2. [Medline]. Orenstein SR, McGowan JD. Efficacy of conservative therapy as taught in the primary care setting for symptoms suggesting infant gastroesophageal reflux. J Pediatr. 2008 Mar. 152(3):310-4. [Medline]. Salvatore S, Savino F, Singendonk M, Tabbers M, Benninga MA, Staiano A, et al. Thickened infant formula: What to know. Nutrition. 2018 May. 49:51-56. [Medline]. Galmiche JP, Brandstatter G, Evreux M, et al. Combined therapy with cisapride and cimetidine in severe reflux oesophagitis: a double blind controlled trial. Gut. 1988 May. 29(5):675-81. [Medline]. Cucchiara S, Gobio-Casali L, Balli F, et al. Cimetidine treatment of reflux esophagitis in children: an Italian multicentric study. J Pediatr Gastroenterol Nutr. 1989 Feb. 8(2):150-6. [Medline]. Simeone D, Caria MC, Miele E, Staiano A. Treatment of childhood peptic esophagitis: a double-blind placebo-controlled trial of nizatidine. J Pediatr Gastroenterol Nutr. 1997 Jul. 25(1):51-5. [Medline]. Chiba N. Proton pump inhibitors in acute healing and maintenance of erosive or worse esophagitis: a systematic overview. Can J Gastroenterol. 1997 Sep. 11 Suppl B:66B-73B. [Medline]. Gilger MA, Tolia V, Vandenplas Y, Youssef NN, Traxler B, Illueca M. Safety and tolerability of esomeprazole in children with gastroesophageal reflux disease. J Pediatr Gastroenterol Nutr. 2008 May. 46(5):524-33. [Medline]. Gold BD, Gunasekaran T, Tolia V, Wetzler G, Conter H, Traxler B. Safety and symptom improvement with esomeprazole in adolescents with gastroesophageal reflux disease. J Pediatr Gastroenterol Nutr. 2007 Nov. 45(5):520-9. [Medline]. Bishop J, Furman M, Thomson M. Omeprazole for gastroesophageal reflux disease in the first 2 years of life: a dose-finding study with dual-channel pH monitoring. J Pediatr Gastroenterol Nutr. 2007 Jul. 45(1):50-5. [Medline]. James L, Walson P, Lomax K, Kao R, Varughese S, Reyes J. Pharmacokinetics and tolerability of rabeprazole sodium in subjects aged 12 to 16 years with gastroesophageal reflux disease: an open-label, single- and multiple-dose study. Clin Ther. 2007 Sep. 29(9):2082-92. [Medline]. Omari T, Davidson G, Bondarov P, Nauclér E, Nilsson C, Lundborg P. Pharmacokinetics and acid-suppressive effects of esomeprazole in infants 1-24 months old with symptoms of gastroesophageal reflux disease. J Pediatr Gastroenterol Nutr. 2007 Nov. 45(5):530-7. [Medline]. Khoshoo V, Dhume P. Clinical response to 2 dosing regimens of lansoprazole in infants with gastroesophageal reflux. J Pediatr Gastroenterol Nutr. 2008 Mar. 46(3):352-4. [Medline]. Zhang W, Kukulka M, Witt G, Sutkowski-Markmann D, North J, Atkinson S. Age-dependent pharmacokinetics of lansoprazole in neonates and infants. Paediatr Drugs. 2008. 10(4):265-74. [Medline]. Springer M, Atkinson S, North J, Raanan M. Safety and pharmacodynamics of lansoprazole in patients with gastroesophageal reflux disease aged Paediatr Drugs</i>. 2008. 10(4):255-63. [Medline]. Cucchiara S, Minella R, Iervolino C, et al. Omeprazole and high dose ranitidine in the treatment of refractory reflux oesophagitis. Arch Dis Child. 1993 Dec. 69(6):655-9. [Medline]. Strauss RS, Calenda KA, Dayal Y, Mobassaleh M. Histological esophagitis: clinical and histological response to omeprazole in children. Dig Dis Sci. 1999 Jan. 44(1):134-9. [Medline]. Rudolph CD. Are proton pump inhibitors indicated for the treatment of gastroesophageal reflux in infants and children?. J Pediatr Gastroenterol Nutr. 2003 Nov-Dec. 37 Suppl 1:S60-4. [Medline]. Hassall E, Israel D, Shepherd R, et al. Omeprazole for treatment of chronic erosive esophagitis in children: a multicenter study of efficacy, safety, tolerability and dose requirements. International Pediatric Omeprazole Study Group. J Pediatr. 2000 Dec. 137(6):800-7. [Medline]. Tolia V, Ferry G, Gunasekaran T, et al. Efficacy of lansoprazole in the treatment of gastroesophageal reflux disease in children. J Pediatr Gastroenterol Nutr. 2002. 35 Suppl 4:S308-18. [Medline]. Rode H, Stunden RJ, Millar AJ, Cywes S. Esophageal pH assessment of gastroesophageal reflux in 18 patients and the effect of two prokinetic agents: cisapride and metoclopramide. J Pediatr Surg. 1987 Oct. 22(10):931-4. [Medline]. Ariagno RL, Kikkert MA, Mirmiran M, et al. Cisapride decreases gastroesophageal reflux in preterm infants. Pediatrics. 2001 Apr. 107(4):E58. [Medline]. Bozkurt M, Tutuncuoglu S, Serdaroglu G, et al. Gastroesophageal reflux in children with cerebral palsy: efficacy of cisapride. J Child Neurol. 2004 Dec. 19(12):973-6. [Medline]. FDA. FDA Requires Boxed Warning and Risk Mitigation Strategy for Metoclopramide-Containing Drugs. U.S. Food and Drug Administration. Available at http://www.fda.gov/NewsEvents/Newsroom/PressAnnouncements/ucm149533.htm. Casteels-Van Daele M, Jaeken J, Van der Schueren P, Van den Bon P. Dystonic reactions in children caused by metoclopramide. Arch Dis Child. 1970 Feb. 45(239):130-3. [Medline]. Low LC, Goel KM. Metoclopramide poisoning in children. Arch Dis Child. 1980 Apr. 55(4):310-1. [Medline]. Bateman DN, Craft AW, Nicholson E, Pearson AD. Dystonic reactions and the pharmacokinetics of metoclopramide in children. Br J Clin Pharmacol. 1983 May. 15(5):557-9. [Medline]. Keady S. Update on drugs for gastro-oesophageal reflux disease. Arch Dis Child Educ Pract Ed. 2007 Aug. 92(4):ep114-8. [Medline]. Ng SC, Gomez JM, Rajadurai VS, Saw SM, Quak SH. Establishing enteral feeding in preterm infants with feeding intolerance: a randomized controlled study of low-dose erythromycin. J Pediatr Gastroenterol Nutr. 2003 Nov. 37(5):554-8. [Medline]. Wilkinson JD, Dudgeon DL, Sondheimer JM. A comparison of medical and surgical treatment of gastroesophageal reflux in severely retarded children. J Pediatr. 1981 Aug. 99(2):202-5. [Medline]. Fonkalsrud EW, Ament ME, Berquist W. Surgical management of the gastroesophageal reflux syndrome in childhood. Surgery. 1985 Jan. 97(1):42-8. [Medline]. Fonkalsrud EW, Berquist W, Vargas J. Surgical treatment of the gastroesophageal reflux syndrome in infants and children. Am J Surg. 1987 Jul. 154(1):11-8. [Medline]. Boix-Ochoa J, Marhuenda C. Gastroesophageal reflux disease. Ashcraft KW, et al, eds. Pediatric Surgery. Philadelphia, PA: WB Saunders Co; 2000. 370-89. Esposito C, Montupet P, van Der Zee D, Settimi A, Paye-Jaouen A, Centonze A. Long-term outcome of laparoscopic Nissen, Toupet, and Thal antireflux procedures for neurologically normal children with gastroesophageal reflux disease. Surg Endosc. 2006 Jun. 20(6):855-8. [Medline]. Wagener S, Sudhakaran N, Cusick E. Watson fundoplication in children: a comparative study with Nissen fundoplication. J Pediatr Surg. 2007 Jun. 42(6):1098-102. [Medline]. Glen P, Chassé M, Doyle MA, Nasr A, Fergusson DA. Partial versus Complete Fundoplication for the Correction of Pediatric GERD: A Systematic Review and Meta-Analysis. PLoS One. 2014. 9(11):e112417. [Medline]. [Full Text]. Bammer T, Hinder RA, Klaus A, Klingler PJ. Five- to eight-year outcome of the first laparoscopic Nissen fundoplications. J Gastrointest Surg. 2001 Jan-Feb. 5(1):42-8. [Medline]. Geiger J, Graziano K, Teitelbaum DH, et al. Recurrence after laparoscopic and open nissen fundoplication: a comparison of the true mechanisms of failure. Paper presented at: American Pediatric Surgical Association 32nd Annual Meeting; 2001. Blewett C, Hollenbeak C, Cilley R, et al. Economic implications of current surgical management of gastroesophageal reflux. Presented at: 32nd Annual Meeting of the American Pediatric Surgical Association, Naples, FL, May 20-23, 2001. Esposito C, Saxena A, Irtan S, Till H, Escolino M. Laparoscopic Nissen Fundoplication: An Excellent Treatment of Gerd-Related Respiratory Symptoms in Children-Results of a Multicentric Study. J Laparoendosc Adv Surg Tech A. 2018 Feb 21. [Medline]. Esposito C, Montupet P, Reinberg O. Laparoscopic surgery for gastroesophageal reflux disease during the first year of life. J Pediatr Surg. 2001 May. 36(5):715-7. [Medline]. Diaz DM, Gibbons TE, Heiss K, et al. Antireflux surgery outcomes in pediatric gastroesophageal reflux disease. Am J Gastroenterol. 2005 Aug. 100(8):1844-52. [Medline]. Esposito C, Langer JC, Schaarschmidt K, et al. Laparoscopic antireflux procedures in the management of gastroesophageal reflux following esophageal atresia repair. J Pediatr Gastroenterol Nutr. 2005 Mar. 40(3):349-51. [Medline]. Hill SJ, Pandya S, Clifton MS, Bhatia A, Wulkan ML. Cardiaplication: a novel surgical technique for refractory gastroesophageal reflux in the pediatric population. J Laparoendosc Adv Surg Tech A. 2011 Nov. 21(9):873-5. [Medline]. Dunn JC, Lai EC, Webber MM, et al. Long-term quantitative results following fundoplication and antroplasty for gastroesophageal reflux and delayed gastric emptying in children. Am J Surg. 1998 Jan. 175(1):27-9. [Medline]. Fonkalsrud EW, Ellis DG, Shaw A, et al. A combined hospital experience with fundoplication and gastric emptying procedure for gastroesophageal reflux in children. J Am Coll Surg. 1995 Apr. 180(4):449-55. [Medline]. Bustorff-Silva J, Fonkalsrud EW, Perez CA, et al. Gastric emptying procedures decrease the risk of postoperative recurrent reflux in children with delayed gastric emptying. J Pediatr Surg. 1999 Jan. 34(1):79-82; discussion 82-3. [Medline]. Fonkalsrud EW, Ament ME, Vargas J. Gastric antroplasty for the treatment of delayed gastric emptying and gastroesophageal reflux in children. Am J Surg. 1992 Oct. 164(4):327-31. [Medline]. Pacilli M, Pierro A, Lindley KJ, Curry JI, Eaton S. Gastric emptying is accelerated following laparoscopic Nissen fundoplication. Eur J Pediatr Surg. 2008 Dec. 18(6):395-7. [Medline]. Gadenstatter M, Klingler A, Prommegger R, et al. Laparoscopic partial posterior fundoplication provides excellent intermediate results in GERD patients with impaired esophageal peristalsis. Surgery. 1999 Sep. 126(3):548-52. [Medline]. Chrysos E, Tzortzinis A, Tsiaoussis J, et al. Prospective randomized trial comparing Nissen to Nissen-Rossetti technique for laparoscopic fundoplication. Am J Surg. 2001 Sep. 182(3):215-21. [Medline]. Estevao-Costa J, Campos M, Dias JA, et al. Delayed gastric emptying and gastroesophageal reflux: a pathophysiologic relationship. J Pediatr Gastroenterol Nutr. 2001 Apr. 32(4):471-4. [Medline]. Sampson LK, Georgeson KE, Royal SA. Laparoscopic gastric antroplasty in children with delayed gastric emptying and gastroesophageal reflux. J Pediatr Surg. 1998 Feb. 33(2):282-5. [Medline]. Smith CD, Othersen HB, Gogan NJ, Walker JD. Nissen fundoplication in children with profound neurologic disability. High risks and unmet goals. Ann Surg. 1992 Jun. 215(6):654-8; discussion 658-9. [Medline]. Knight CG, Lorincz A, Gidell KM, et al. Computer-assisted robot-enhanced laparoscopic fundoplication in children. J Pediatr Surg. 2004 Jun. 39(6):864-6; discussion 864-6. [Medline]. Lehnert M, Richter B, Beyer PA, Heller K. A prospective study comparing operative time in conventional laparoscopic and robotically assisted Thal semifundoplication in children. J Pediatr Surg. 2006 Aug. 41(8):1392-6. [Medline]. Triadafilopoulos G, DiBaise JK, Nostrant TT, et al. The Stretta procedure for the treatment of GERD: 6 and 12 month follow-up of the U.S. open label trial. Gastrointest Endosc. 2002 Feb. 55(2):149-56. [Medline]. Richards WO, Houston HL, Torquati A, et al. Paradigm shift in the management of gastroesophageal reflux disease. Ann Surg. 2003 May. 237(5):638-47; discussion 648-9. [Medline]. Islam S, Geiger JD, Coran AG, Teitelbaum DH. Use of radiofrequency ablation of the lower esophageal sphincter to treat recurrent gastroesophageal reflux disease. J Pediatr Surg. 2004 Mar. 39(3):282-6; discussion 282-6. [Medline]. Mahmood Z, McMahon BP, Arfin Q, et al. Endocinch therapy for gastro-oesophageal reflux disease: a one year prospective follow up. Gut. 2003 Jan. 52(1):34-9. [Medline]. [Full Text]. Thomson M, Fritscher-Ravens A, Hall S, et al. Endoluminal gastroplication in children with significant gastro-oesophageal reflux disease. Gut. 2004 Dec. 53(12):1745-50. [Medline]. [Full Text]. Lee SL, Sydorak RM, Chiu VY, Hsu JW, Applebaum H, Haigh PI. Long-term antireflux medication use following pediatric Nissen fundoplication. Arch Surg. 2008 Sep. 143(9):873-6; discussion 876. [Medline]. Ravelli AM, Milla PJ. Vomiting and gastroesophageal motor activity in children with disorders of the central nervous system. J Pediatr Gastroenterol Nutr. 1998 Jan. 26(1):56-63. [Medline]. Richards CA, Andrews PL, Spitz L, Milla PJ. Nissen fundoplication may induce gastric myoelectrical disturbance in children. J Pediatr Surg. 1998 Dec. 33(12):1801-5. [Medline].